If you are new to React then, understandably, you just want to get coding, and play around with some simple components to see how React works. You really don't want to have to wade through a lengthy setup process in the first instance. In this tutorial I'll show you how to begin coding with React in seconds, almost completely removing the setup process! 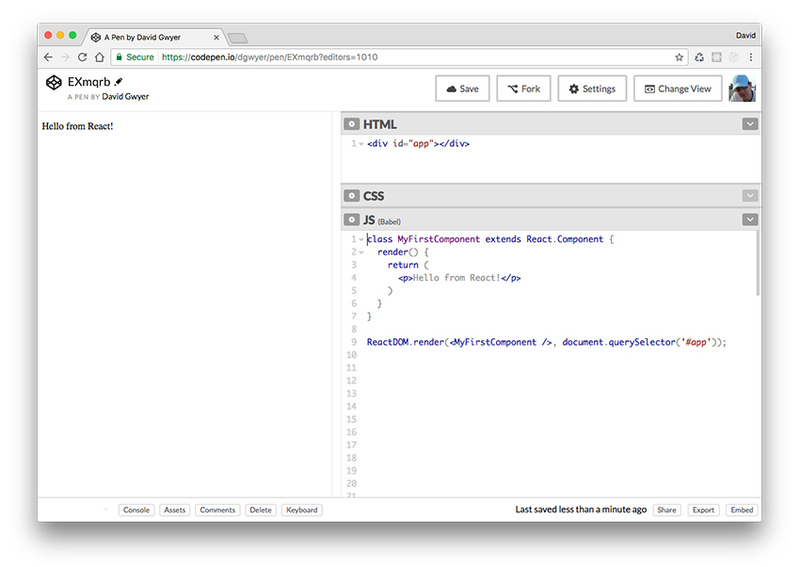 You'll be using CodePen, an online code editor, that enables you to begin writing React code instantly. A useful side effect of using online code editors is that you can easily share your work with others via a unique URL. Anything you create can also be searched for by other developers looking for React-based examples. Let's take a look at CodePen and see just how easy it is to set up React and start coding your first app! 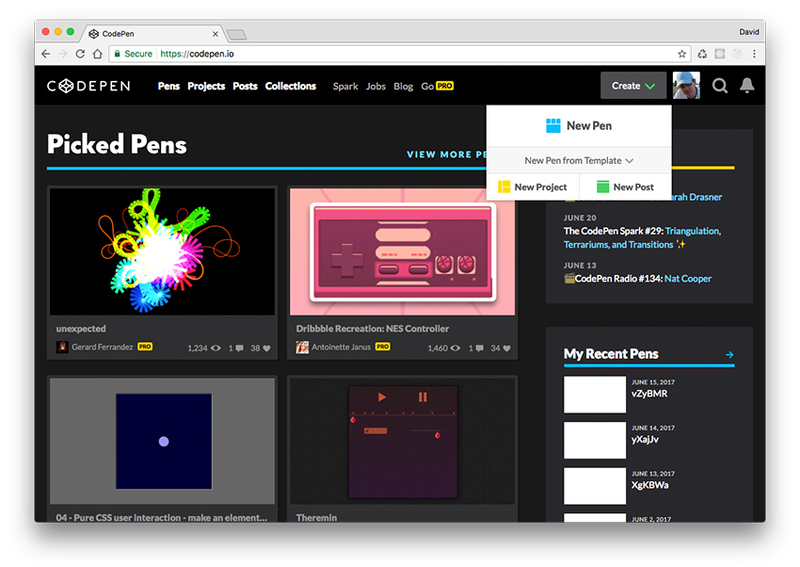 Every new creation in CodePen is called a 'pen'. Go to the homepage and click the large Create button at the top right of the screen, and then New Pen from the dropdown menu. Depending on your default settings, the three editors will either be on the left/right side of the main window or laid out across the top in a single row. 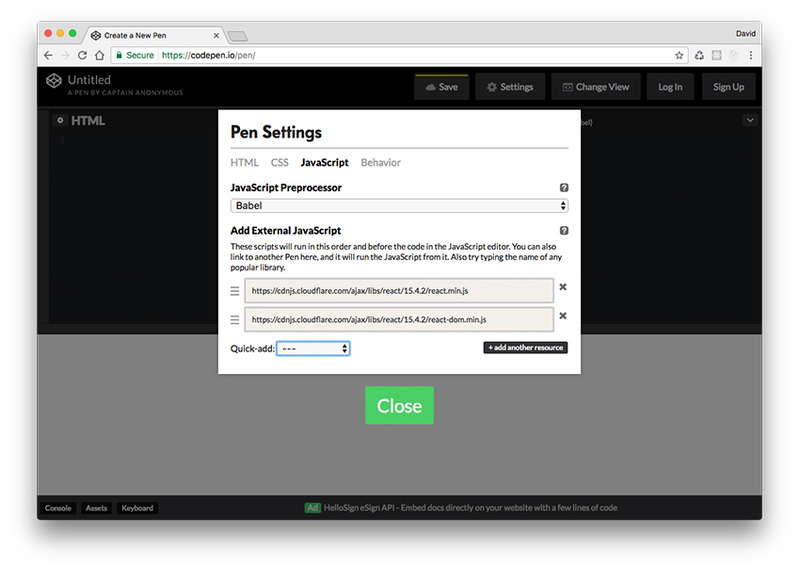 The CodePen output window is updated automatically every time you type in any one of the editor windows. This is optional and can be disabled via the pen's settings. Click on the Quick-add dropdown and select React from the list. Notice that React is added to the first input box with the full path to the library specified. Click the drop down again to add React DOM. This is needed as we're rendering our React components to the browser DOM. The exact versions of React, and React DOM scripts, may be slightly different on your screen as CodePen will inevitably update to the latest version from time to time. In the HTML CodePen editor window, add a single <div id="app"> element. This serves as an empty placeholder our React app can use to render out our component. This is pretty much the most basic version of a component possible in React. We used an ES6 class to extend the core React component class, which implements a render() method and returns a HTML element. The first argument is the React component you want to render, and the second specifies which DOM element to render to. The second component is very similar to the first one, and we render it out to the div element with id of app2 with another call to ReactDOM.render(). However, it's not very efficient to render out individual components this way. The currently accepted approach is to define a top-level component such as <App />, which contains all other components in your React app. Then, all you need is a single call to RenderDOM.render(), rather than a separate call for each component. So let's refactor our very simple React app to make use of this top-level component approach. 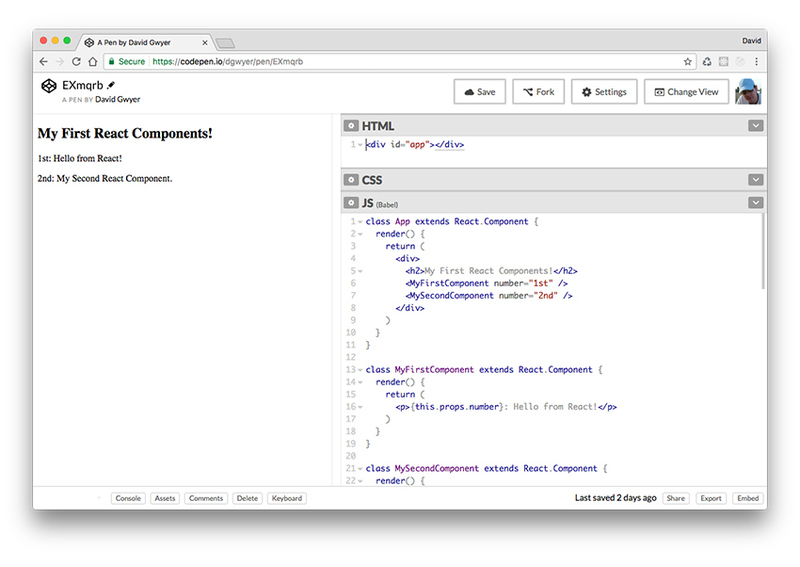 Now, our React app is entirely self-contained via a single top-level component. Notice that it's comprised of HTML elements and React components. This makes it very easy to structure your app however you want. Now, what if we wanted to add some information to <MyFirstComponent /> and <MySecondComponent /> but didn't want to necessarily specify it inside the component definitions? We can do this by passing down information to child components from parent components using HTML attribute like syntax. This is know as props in React. 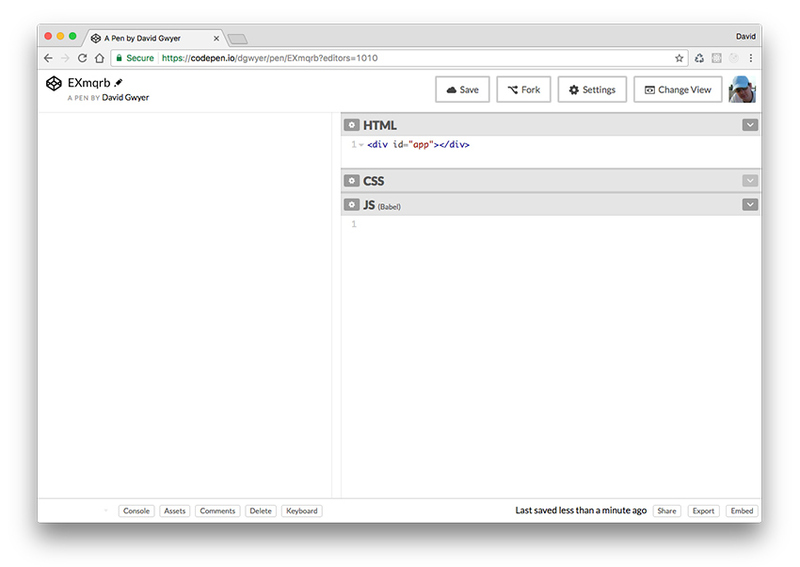 Let's quickly recap on how easy it was to start coding with React using CodePen. 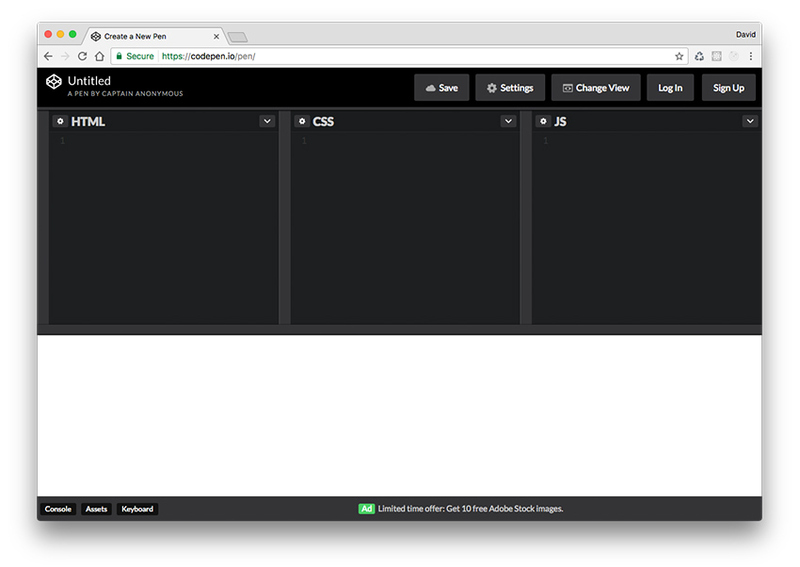 Using CodePen, you can get a React component outputted to the screen within just a couple of minutes! However, it does have some limitations. 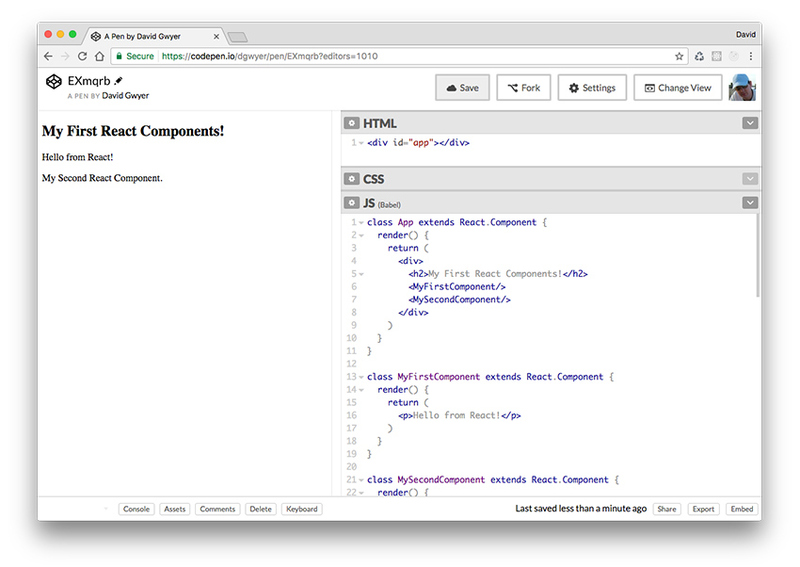 Modern React best practices for React development recommend a modular approach, with each component in a separate file. You can't do this with the basic version of CodePen. Also, because the CodePen output window is embedded inside an iframe element, you don't have access to the browser React developer tools, which is an important consideration as your apps get more complex. For beginners, though, and for quickly testing out new ideas for simple apps, CodePen is a great tool for React development. You could also use it to create an online portfolio, or as your own mini-library of React components ready to paste into other projects. There are plenty of other online code editors similar to CodePen such as JSFiddle, JS Bin, and many others. In the next tutorial, we'll focus on setting up React apps locally.